I love love love love love French toast. Love it. But at the same time, part of me doesn’t really get it. Don’t get me wrong – I know what it is, and I know how to make it, but I feel like it occupies a strange culinary and cultural position that I just can’t figure out. First of all, I don’t get why it’s got a reputation for being difficult and/or time-consuming, and I can’t figure out why. It’s simply a matter of mixing basic kitchen staples and throwing the whole shebang in a frying pan. It’s also a great way to use up leftover bread, as it works better with a day-old loaf. In fact, the French name (because of course the French don’t call it French toast) is pain perdu (lost bread) – a direct reference to the dish’s ability to reclaim and reinvigorate stale bread. On top of that, it scales really easily, making it ideal for two people or twenty. So while it’s got a definite elaborate-brunch status, it’s just as easy to whip up for a simple (albeit indulgent) breakfast or lunch. Anyway, I can deal with misconceptions concerning difficulty. What really drives me nuts is the way that French toast is generally plated and presented. Specifically, the way that the simple combination of eggs, milk, and bread gets absolutely basted in cloying, over-the-top sweetness. The toast itself is often treated like an afterthought, with the focus instead falling on its ability to act as a vessel/sponge for syrup, heavily sweetened fruit purees, and unseemly quantities of whipped cream. Don’t get me wrong – sweetness definitely makes the whole thing come alive. But it seems like all too often French toast is positively drowning in sugar. I find myself wondering if it’s some kind of brunch inferiority complex (i.e. the bread just doesn’t seem exciting enough so the toppings overcompensate), or if it’s simply a lazy and generic way to put together an inoffensive meal. Perhaps it’s a bit of both. Regardless, brunch should be a merger between breakfast and lunch, not breakfast and dessert. In fact, I just want to go on record and say that over-sweetened brunch carbs are an annoying trend that I’d like to see quashed right now. If your breakfast is nearly indistinguishable from a rather large piece of cake, you might be missing the point of the meal. Lest any of you think that I’m going to propose some bland health-foodified version of French toast, let me take a moment to allay your fears. This recipe proudly boasts sugar, real whipping cream, maple syrup, and plenty of melt-in-your-mouth airy-and-eggy challah bread. But the core concept is that flavours should be built and balanced, and not dominated by overarching sweetness. 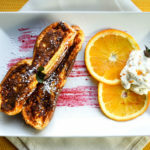 The French toast itself departs from the standard neutral base by incorporating bitter/sour orange flavours, while the maple and cream are combined into an amazing dual-purpose topping. The effect is a synergistic one; a little maple and cream go a long, long way, and neither one needs to be used in excess. Even the raspberry puree (which is optional but recommended) is completely devoid of added sugar, as the balancing tart/sour flavour of the fruit is what we’re really looking for. But ultimately, because the toast itself brings citrus flavour into the equation, you can vary your toppings based on your time/ingredients and still end up with a lovely meal. Even without the whipped cream, a bit of maple syrup (the real stuff – always the real stuff), a handful of raspberries, and some fresh orange slices would still make this a breakfast to remember. There’s nothing complicated going on here. If you’ve ever made French toast, you’ll find that this isn’t much of a departure in terms of technique. Still I will (as always) give a few tips and tricks to help you really nail this. As mentioned above, this is best with a nice, dense, day-old bread. In my opinion, nothing compares to challah when it comes to making good French toast. I buy mine from a bakery of Friday (challah is often easiest to find around the Jewish sabbath) and I’m all set for a nice Saturday morning brunch. Other egg-enriched breads (pulla, zopf, etc.) would work beautifully too. Airy and egg-free breads like French bread or ciabbatta also work quite well, though they tend to yield a somewhat chewier final product, and generally requires a slightly longer soak in the egg/milk mixture before frying. If you can, avoid standard grocery-store loaf bread for this recipe; they tend to be too soft and to soak up the egg mixture too quickly, making for an overly soft/mushy end product. Seville (or bitter) orange is an intense flavor – orangey yes, but sour, bitter and aromatic all at once. You can learn all about finding, choosing, and using them at this Ingredient Page here on the site. The key to using them here is to treat the juice and the zest as related but very different ingredients. Adding the juice to the egg/milk mixture delivers some orange flavour, but it primarily contributes a sour/bitter component that balances the richness and sweetness found in other parts of the recipe. In terms of the orange flavour however, it’s really the zest that does the bulk of the work, so be sure to include it. In fact, you can actually increase the quantity a little bit if you want a more intensely orange flavour to shine through (the flavour is relatively understated as-is). If you can’t find Seville oranges, you can use any orange citrus, including sweet oranges, tangerines, etc. That being said, if you do go with a sweet orange, I would recommend replacing the juice with a mixture of orange and lemon juice in order to round out the sweetness and bring some acidity back into the equation. You could also experiment with other citrus flavours – grapefruit and pomelo would both substitute nicely (though I personally think orange works best with the maple flavour). The maple whipped cream is just sweet and rich enough to round the whole thing out without overpowering the other ingredients. In my opinion, the maple flavour comes through perfectly – it’s present and it’s distinctive, but it’s not overwhelming. It also works quite nicely with the small amount of added vanilla. That being said, die-hard maple addicts are forgiven if they want to add an extra glug (a very technical measurement, I know) to individual servings. An earlier iteration of this recipe didn’t include the raspberry puree, but I’m much happier for its inclusion. Not only does it add a nice punch of colour, but the sweet/sour flavour really balances the rich whipped cream and the eggy bread. If you’re making this during citrus season (i.e. late fall to early spring) you’ll probably be hard-pressed to find good raspberries. Fortunately, frozen raspberries are even easier to use. Take a small handful, throw them in a bowl and microwave until soft, then crush them with a spoon. If you don’t like raspberry seeds, you can press the mixture through a small strainer. The rest is pretty straightforward. A very light sprinkling of powdered (aka superfine) serves a purpose very much like a sprinkling of sea-salt used to finish a savoury dish; a small amount, spread evenly, delivers a flavour with immediate impact on the palate and prevents the overuse of other similarly flavoured components. A few thinly sliced sweet oranges (NOT Seville oranges) dress the plate up and help to extend the orange flavour a bit further. A sprig or two of mint is a nice visual touch, but it also works well with the citrus. I used chocolate mint from my garden which has a lovely hue and a very distinctive minty punch. Despite the name, there’s no chocolate flavour involved – the ingredient is named for its colouring and its ability to perfectly compliment chocolate. Still, I do wonder what a tiny bit of grated dark chocolate might do to finish this off. If you end up giving it a shot, let me know in the comments. GOOD NEWS:Amazingly low in calories and fat, especially for something that basically amounts to bread topped with cream. Proof that moderation and flavourful cooking can, in fact, trump drowning your food with fat, sugar, and salt. BAD NEWS:This is a somewhat vitamin-poor dish on its own, but adding the extra fruit really helps. While this dish isn’t terribly high in sodium, it is easy to see how a very small amount of salt (the salt in the bread plus a measly 1/2 tsp) can really add up. Slice the bread on an angle into rounds approximately 2 cm (~1 inch) thick. Combine eggs, milk, orange juice and zest, sugar, cinnamon, and salt. Mix thoroughly. Soak each piece of bread in the egg/milk mixture for about 20 seconds per side (a little longer if you use staler or very airy bread, [e.g. baguette]). Remove the bread from the mixture, brushing off the excess, and set aside. If so desired, you can easily work in batches rather than soaking all of the slices before cooking. Heat a large cast iron skillet or griddle over medium heat. Add the pieces of bread and cook until golden brown (about 2 minutes). Flip and cook the other side. Serve slices of French toast with whipped cream, and (optional) raspberry puree and orange slices. Use a small sifter to sprinkle a little powdered sugar over the slices and garnish with a bit of extra orange zest and mint leaves. The garnishes are optional, but the orange zest in particular is a really nice way to emphasize the citrus flavour. Likewise, the raspberry puree adds a contrasting sourness that really helps round out the dish, so include it if you can. If you can, avoid standard grocery-store loaf bread for this recipe - its softness and the fact that it soaks up a lot of egg mixture makes it overly dense and mushy. Challah is hands-down my favourite bread for making this (or any French toast), as it yields a very light and airy French toast while soaking up the egg/milk mixture perfectly. If you can't find challah, day-old French bread or ciabatta will also work well. AAhhhhh pain perdu! Honestly nothing compares to the real thing when my grandma (in France) would make it with her old dry stale baguette, carefully roasting at a simmering heat in her clay pot. We used to eat it with a little bit of sugar sprinkled on top (maple syrup not being readily available at that time over there). That’s very true Gabrielle – restaurant French toast/pain perdu is all-too-frequently overly eggy. I’m guessing that this is done to make it faster and easier to cook, as the milkier custard-like version has to cook a little slower and more carefully. I love eggs, but I don’t think this is meant to be a very eggy meal. In fact, I think it’s one of the best ways to ‘hide’ eggs in a meal for those who don’t love the taste. My brother never liked eggs as a kid, but he would always eat French toast. Thanks for sharing your reminiscences from your Grandma. I love those little food-based memories, and I’m always happy to hear them from others. Amazing marriage of flavours – the seville orange with the whipped maple cream and raspberry puree is well balanced and a good combination. What I really like about this french toast is that it is light without much added sugar and is naturally sweetened and flavoured with orange juice. I would love to have it for a Sunday morning breakfast. Thank you Fouzia! Truth be told the orange juice doesn’t add a whole lot of sweetness, as Seville orange juice is rather sour. But a little bit of sweetness goes a long way here, so the whole thing feels quite well balanced, in my opinion. The maple whipped cream is wonderful too, because the combination of rich fat and relatively minimal sugar gives you an impression that the whole thing is a little sweeter than it is. You are so right Sean, although I love my sweets, I cannot stand the overly sweet sweets, and French toasts, sometimes, they are just that. I’d love to find Seville oranges, still a battle here, haven’t seen any, and try your french toast recipe. Plus, the challah bread, what a beautiful texture for the pain perdu. This dish reaches perfection with that whipped maple cream and the touch of chocolate mint. Wow! Thank you so much Nicoletta! Next winter, consider approaching a grocery store (or possibly the Italian Centre Shop, as I know you do a fair bit of work with them in Edmonton) and see if they could bring in a case of the oranges. They’re beautiful to work with, and they last for a rather long time. I know that grocery stores CAN get them, it’s simply that they don’t generally see enough demand to make it worth their while. This is of course complicated by the fact that many people won’t recognize them, and many others simply haven’t heard of them, so they’re a tough sell. We will try that, Sean! Thanks for the suggestion, I’d really love to work with them. I also love, love French toast! Few vitamins – la, la, la, la ,la. Great post! Buying the bread tomorrow! Thank you Diane! Let me know how it goes and what kind of citrus you end up using! Cheers! I have never been a fan of french toast. I don’t know why… they always look so pretty and tasty, but for some reason, toast dipped in egg and fried doesn’t sit well with me..weird eh? I have to say though this version with the Seville oranges does look so good! Maybe I’ll give it another try one of these days! I’m glad this version appeals to you though. I often find that when a standard version of a dish doesn’t really do it for me that I gravitate towards a variation of some kind. So who knows? I hope you get a chance to take a shot at it in the future. Thanks Markus! I had no idea that French toast had a reputation for being difficult or time-consuming. You’re right — that is silly. I abso-freaking-lutely LOVE French toast (though I never make it for whatever reason…), and I especially love recipes that elevate it a bit by jazzing it up with fun ingredients. This is beautiful and sound delish, my man! Now. Making a mental note: MAKE FRENCH TOAST. Sean, you did such a beautiful job with the reshoot! This dish looks indulgent, flavourful and fresh — and I can only imagine how delicious this medley of flavours are. I’m not really big on pancakes / waffles but I used to LOVE french toast on occasion when I could eat bread, but haven’t given it a gluten free spin yet. Something to consider! 🙂 Thanks for the inspiration and enjoy the rest of your Sunday. Thank you so much Justine! That means a lot coming from you. I have somewhat limited experiences with gluten-free bread, but what I’ve had before has been rather soft. I think that would probably soak up the egg mixture quite quickly, so as long as you keep a close eye on things and avoid soaking it for too long, it would probably work quite well. I hope you can give it a spin at some point – I’m always interested in hearing about variations and adaptations, especially in regard to dietary restrictions. Cheers!